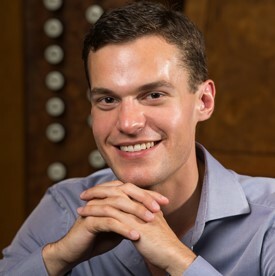 A star among young classical musicians, concert organist Nathan Laube has quickly earned a place among the organ world’s elite performers. In addition to his busy performing schedule, Mr. Laube serves as Assistant Professor of Organ at The Eastman School of Music in Rochester, New York, where he teaches with distinguished professors David Higgs and Edoardo Bellotti. Recent and upcoming performances by Mr. Laube include major venues spanning four continents. These include the Vienna Konzerthaus (Austria); the Berlin Philharmonie and the Dortmund Konzerthaus (Germany); Aarhus Cathedral and Copenhagen Cathedral (Denmark); the Cankarjev Dom, Ljubljana (Slovenia); the Sejong Center, Seoul (Korea); in the USA at Overture Hall, Madison (WI) where he performed with the Madison Symphony under the direction of Julian Wachner; The Schermerhorn Symphony Center, Nashville (TN) where he performed and recorded the Stephen Paulus Grand Organ Concerto with the Nashville Symphony under the directions of Giancarlo Guerrero; Washington National Cathedral (DC), Walt Disney Concert Hall (CA), Verizon Hall (PA), The Kauffman Center’s Helzberg Hall (MO), and Spivey Hall (GA). Nathan also frequently presents concert tours in the United Kingdom where highlight venues have included York Minster, Canterbury Cathedral, Exeter Cathedral, Ely Cathedral, and Truro Cathedral. Highlights of Mr. Laube’s recent and upcoming festival appearances around the world include the Naumburg Orgelsommer, the 300th Anniversary festival of the 1714 Silbermann organ in the Freiberg Cathedral (Germany), the 2011 Lahti Organ Festival (Finland), the 2012 Dresden Music Festival (Germany), the 2013 Orléans Organ Festival (France), the 2013 Lapua Festival (Finland), the 2013 Stuttgart Internationaler Orgelsommer (Germany), the 2014 Naumburg Orgelsommer (Germany), the 2015 Smarano Organ Academy (Italy), the Max Reger Foundation of America’s 2015 Max Reger Festival (USA), the WFMT Bach Project for which he performed the complete Clavierübung III (Chicago, USA), and for several EROI Festivals at the Eastman School of Music (USA). Performances for conventions and conferences are frequent, and this year Mr. Laube will be a featured performer at the 2015 national convention of the Organ Historical Society. He was previously featured at the Society’s conventions in 2009, 2011, and 2012. For the American Guild of Organists, Nathan was featured at their national conventions in 2010 (Washington DC), and in 2012 (Nashville TN), as well as at many regional conventions of the Guild. Mr. Laube holds a Master’s Degree in Organ from the Musikhochschule in Stuttgart, Germany where he was a student of Ludger Lohmann, and recipient of a German DAAD Fellowship Study Scholarship for his studies there. As a recipient of a William Fulbright Grant, Nathan spent the 2010-2011 academic year studying with Michel Bouvard and Jan Willem Jansen at the Conservatoire à Rayonnement Régional de Toulouse where he earned Prix de Spécialisé with the mention “Très Bien” and “Féliciations du Jury,” in addition to the Prix François Vidal from the city of Toulouse. Nathan earned his Bachelor of Music Degree at the Curtis Institute of Music in Philadelphia, where he studied organ with Alan Morrison and piano with Susan Starr. Upon graduating, he received the Institute’s two highest awards, the Landis Award for Excellence in Academics and the Aldwell Award for Excellence in Musical Studies. During his time at the Curtis Institute, Nathan also served as an Assistant Organist at the Wannamaker Grand Court Organ at Macy’s Department Store in downtown Philadelphia. As a church musician, Nathan most recently served from 2011-2013 as Artist-in-Residence at the American Cathedral of the Holy Trinity in Paris, France. Previously, he served as Organ Scholar at Bryn Mawr Presbyterian Church in Philadelphia. ssistant Professor of Music at the Eastman School of Music since fall semester 2013, Nathan J. Laube has quickly earned a place among the organ world’s elite performers. His brilliant playing and gracious demeanor have thrilled audiences and presenters across the United States and in Europe, and his creative programming of repertoire spanning five centuries, including his own virtuoso transcriptions of orchestral works, have earned high praise from critics and peers alike. Mr. Laube’s recording of the Stephen Paulus Grand Concerto for Organ and Orchestrawith the Nashville Symphony was awarded a GRAMMY® for Best Classical Compendium at the 58th annual awards ceremony in February 2016. The celebrated release on the Naxos label features Mr. Laube as concerto soloist with Maestro Giancarlo Guerrero conducting the Nashville Symphony in a compendium of works by Stephen Paulus.